**** Chosen by Winner: Marvin D.
David Broadwell's Presidential Thomas Jefferson Desk Set consists of a roller ball pen and a desk knife using wood certified as being from a Tulip Poplar planted by Thomas Jefferson on his estate, Monticello, salvaged by Historical Woods of America. Broadwell designed and created this entire masterpiece. Truly a study in free-form design. Jefferson was known to have planted a number of tulip poplar tree off the southwest corner of Montecillo. Hollow for many years, it finally died in 2008 and was removed by Historical Woods of America in June of 2008. In his Weather Memorandum Book on April 16, 1807, Jefferson noted planting "1. Laurodendron in margin of SW [shrub circle] from the nursery." This is the exact spot that this poplar tree was growing. The Thomas Jefferson Foundation believed that this was enough evidence to consider and promote this tree as the only one on the property that was definitely original and planted by Jefferson. The ring count taken at the time of salvage also indicated that this tree was alive when Jefferson lived there. All of the wooden parts have been carved in Broadwell's signature organic style, and various metal components have his signature texturing. The base and its components have a hand rubbed oil finish. This one of a kind project was built to be displayed with the National Treasures exhibit that was created by William Jewell of Historical Woods. He selected 30 fine artisans to create contemporary, custom sculptures and functional art to showcase the beautiful, historical woods from his operation. 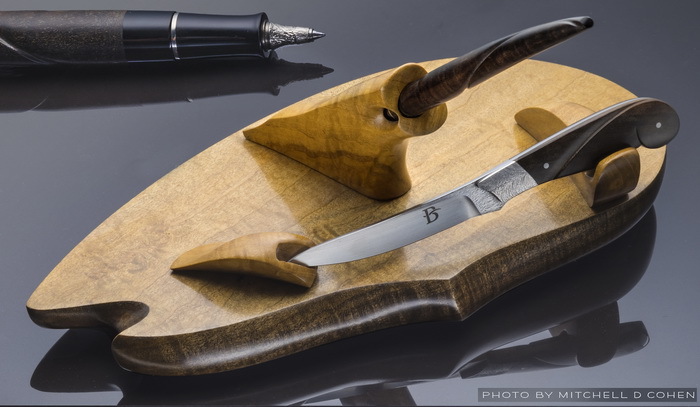 Broadwell was the only knife maker to be chosen as a part of this elite group. The knife blade is 154CM high carbon stainless steel. The blade is heat treated and ground like any proper knife and it is sharpened. Bolsters are stainless steel with a feather texture pattern. The scales are carved from a darker, stabilized piece of Jefferson’s Tulip Poplar. The pen uses black acrylic and the same darker stabilized Tulip Poplar. It takes a modern roller ball refill, Schmidt 5888 or similar. David Broadwell has been an artist all of his life. As a child in school he enjoyed all of the art classes he could take, and when he entered middle and high school took both wood shop and mechanical drawing classes. Like many boys he was interested in cars, airplanes and ships, and spent a lot of time drawing them, probably at the expense of his other subjects! And still to this day he considers himself an artist, and expresses his creativity in his knives, pens, and other functional art. Broadwell’s interest in knives goes back to the time when he was a little boy. There are still fond memories of dressing up in his father’s blue plaid bathrobe, taking up his cardboard shield with the Broadwell coat of arms, and strapping on his father’s Masonic dress sword. There were dragons and dark hearted knights to slay! For several years this interest in edged arms and tools simmered under the surface until in his mid twenties he felt the urge to create a knife. In 1981 Broadwell took a broken file and made his first knife. With its completion Broadwell knew this was what he wanted to do for a living, and he worked toward that end. In 1989 Broadwell left his job as a machinist and became a full time knifemaker. What goes better with fine knives than fine pens? In 2001 Broadwell began creating writing instruments. Many of those childhood drawings were done with fountain pens. Like many with an artist’s mentality, Broadwell had a strong urge, almost an obsession, to give pens a try. Today Broadwell makes fountain, roller ball and ball point pens using some of the same materials as his knives and with the same passion for creativity as with all of his creations. Broadwell has lived in Wichita Falls, Texas, for most of his life. In December 2012 he married his best friend Juanita. He is the father of 2 and step father of 8. Broadwell is involved with his community. He has participated with children’s ministries at his church since his oldest daughter was a toddler. He supports some local charities with their annual fund raisers. Broadwell has been a shooter of firearms since he was a young teenager and has shot pistols competitively in the past. Recreational activities include camping and fly fishing with friends. Broadwell rides a Harley Davidson Sportster motorcycle as much as possible because it’s just good therapy.